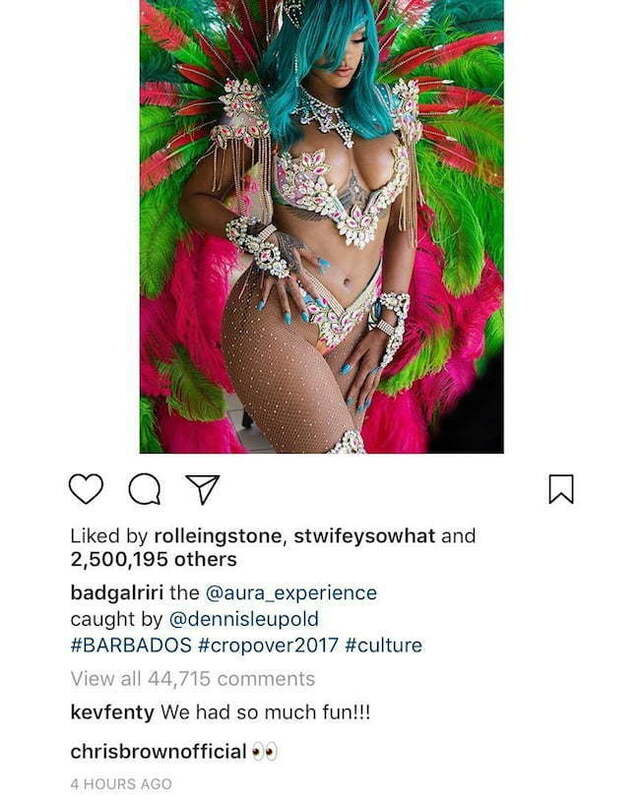 Chris Brown couldn’t help himself when Rihanna start posting photos of herself from this year’s Crop Over in Barbados. Breezy commented the side eye emoji on one of Rihanna’s photos on Instagram and her fans quickly noticed. Within an hour it received over five thousand likes and word quickly spread. Chris Brown is not alone because almost everyone on social media was talking about her banging Rihanna look. It was almost as if she is sending a message to both Chris Brown and Drake. The message was well received. Drake was perhaps too busy with his annual 2017 OVO Fest event in Toronto to leave a comment, but we are pretty sure that he did saw the photos. Perhaps he will sing about it on his next album. Rihanna has been having a great year and despite not releasing an album, she currently has the number two song with “Wild Thoughts” showing a strong presence on the Hot 100. She also has a new movie “Valerian” that has been doing well at the box office. Rihanna is currently working on her next album, but so far there is no word yet on when it will arrive or which direction she will go with it. Her last album ANTI was released in January 2016 and went platinum within the first 24 hours of its release. Considering her commercial success, these past few years have seen Rihanna slowed down how frequent she released albums and go on tours. After all, she also built a massive fashion empire that she has to share some of her time with. Posted on August 8, 2017 by Azlyrics. This entry was posted in Lyrics and tagged ANTI, Barbados, Chris Brown, Wild Thoughts. Bookmark the permalink.